Welp, here we are. I was going to say something in this post about how excited I am to be on the Great American Baking Show, but, well. There's no point saying anything about it now, but that I feel sad about the whole thing. I think the situation speaks for itself and I just have to carry on with my life. So I carry me forward, forward into cake, as always. 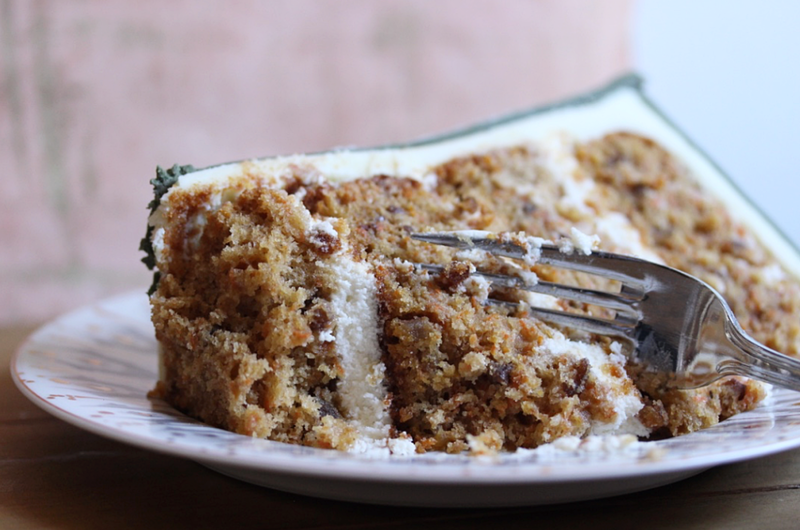 And thank goodness it's carrot cake this time; there's something so homey and comforting about carrot cake--moist and fragrant, nicely balanced warming spices, such an excellent choice for a winter treat. Of course I had to rework the dusty old recipe into something super infallible--that's where the yogurt comes in. Carrot cake is best when it's super rich and moist, and since it's going to have a lot of denseness already in it due to the carrots and nuts, there's no point in trying to make it light and fluffy--best to edge even further to the rich side of things, so yogurt is a perfect pairing here not only for the moisture it brings but the slight tanginess that compliments the earthy, mellow sweetness of carrots. I used my favorite Greek yogurt which I have on hand almost all the time, Fage, which is super rich and creamy and brings the perfect acidity to this cake to make it tender. A little bit of honey and a lot of brown sugar instead of white also help to keep the cake super moist. Oh yes, I said carrots and toasted nuts--no raisins. I really debated on this, because I'm not against raisins per se, but I ultimately decided they just don't belong here. (One reason is that horrible moment when the raisins interact with the cream cheese frosting! My brain barfed just thinking about that.) They are a distraction. Save 'em for your crappy oatmeal raisin cookies. So look, let's just let this be about carrots. Carrots are sweet and interestingly delicate and sufficient as cake inclusions, which is why I'm fully against sweeter show-stealers in carrot cake like pineapple and raisins and figs or whatever. Of course you can add these things to this recipe and it will be just fine, I mean, you don't have to listen to me. I'll just be here, silently judging your choices. Raw coconut gets the side eye. Chocolate chips get Beyond The Valley of the Side Eye. 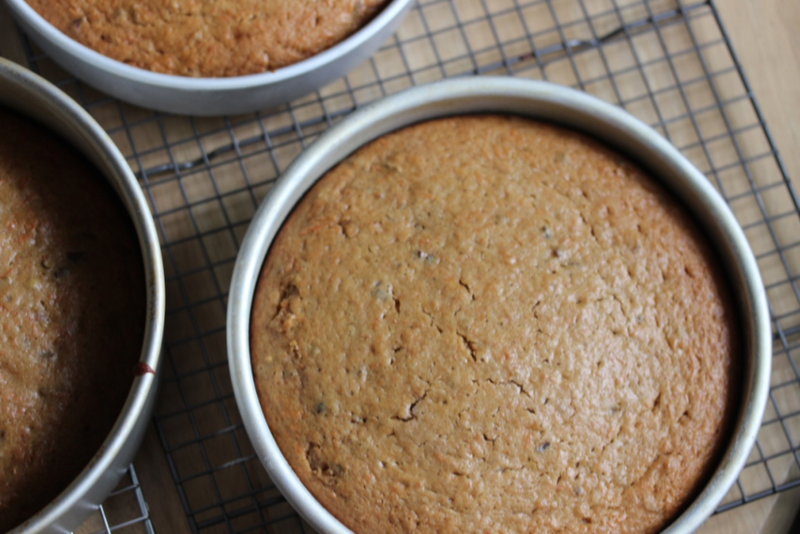 I tried roasting carrots in various ways and adding them to the cake batter but these experiments resulted in a unpleasant Mush Packets instead of bits of flavor. The raw carrot gets a bit baked in the oven, just enough to release some flavor, so that's all the cooking it needs, I found. I also tried two sizes of grated carrots--the regular (large) grated carrots and the finer grated carrots. As is almost always the rule in baking, the more time-consuming and annoying-to-make option is always the tastier option. 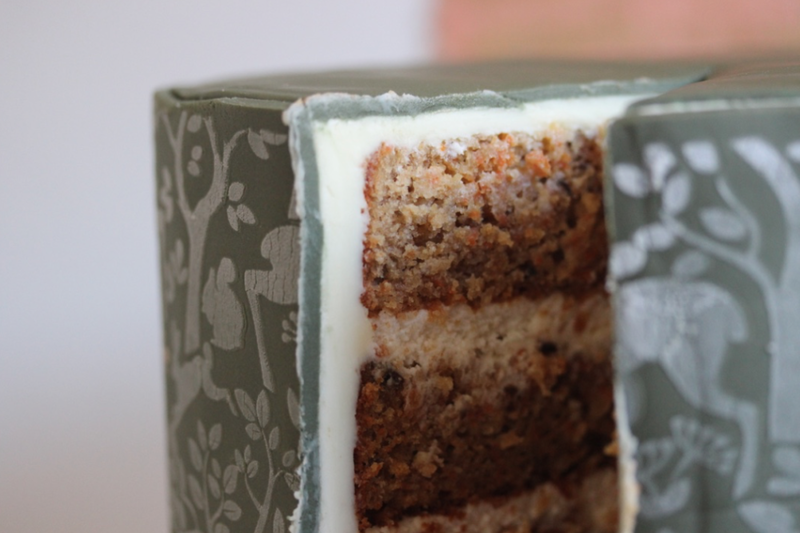 The finer carrot shavings didn't sink to the bottom of the layers and gave the cakes a nicer, finer crumb with no disturbing long carrot strings to contend with. There's really nothing special about this cream cheese frosting recipe other than it is the BEST. I've tried all kinds of proportions of cream cheese to butter and have found the best is equal proportions. I've even tried making a Swiss meringue cream cheese butter cream but it was a disgusting nightmare I'd prefer to not talk about. It's important to whip the butter and cream cheese together for a while to ensure there are no lumps of cream cheese, and I find the little lemon zest is really essential here too. Cream cheese buttercream is notoriously disobedient when it comes to holding a shape so it's best to just go rustic here with your icing technique if covering the whole cake in it. Whip butter, cream cheese, and lemon zest on high speed with a hand mixer or stand mixer until smooth and well-combined, add powdered sugar gradually then the salt and vanilla extract. I opted to double this recipe and cover my cake in white chocolate ganache then use a barrel-wrap technique to cover it in fondant. 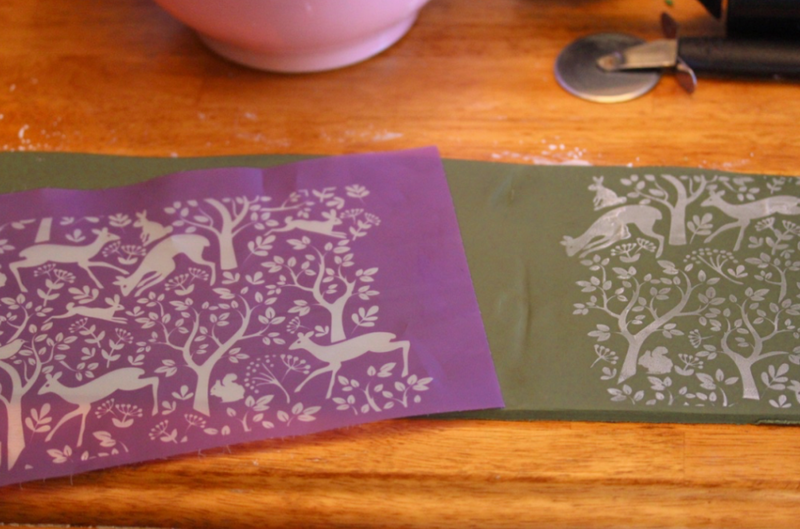 I also wanted to use this stencil from Evil Cake Genius I've been saving for the holiday season. It's so lovely! I stenciled on royal icing then dabbed on some gold luster accents hither and thither. 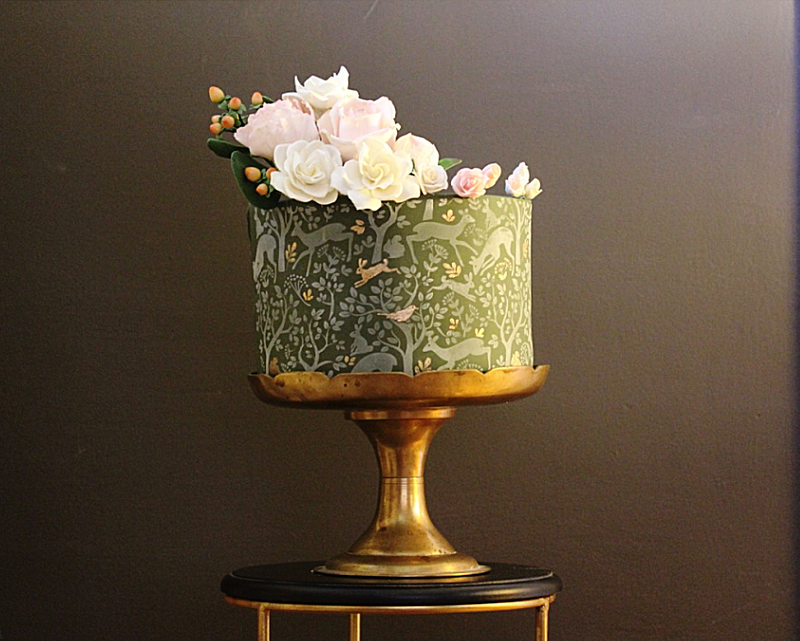 I know the sugar roses and gardenias on top are not exactly seasonal but I thought they added a lightness to the look of the cake and worked with the organic, natural pattern of the stencil. Serve this bb at your next gathering and you'll quickly uncover any Raisin Enthusiasts among the ranks bewailing your grape-less carrot cake--calmly explain to them you have a ball pit full of the wrinkled goobs out back and then lock the door behind them. Preheat oven to 350 degrees F. Grease and flour two eight or nine inch round pans, and line bottoms with parchment paper. Mix together all the dry ingredients--flour, baking soda, baking powder, and spices--with a whisk until combined and set aside. 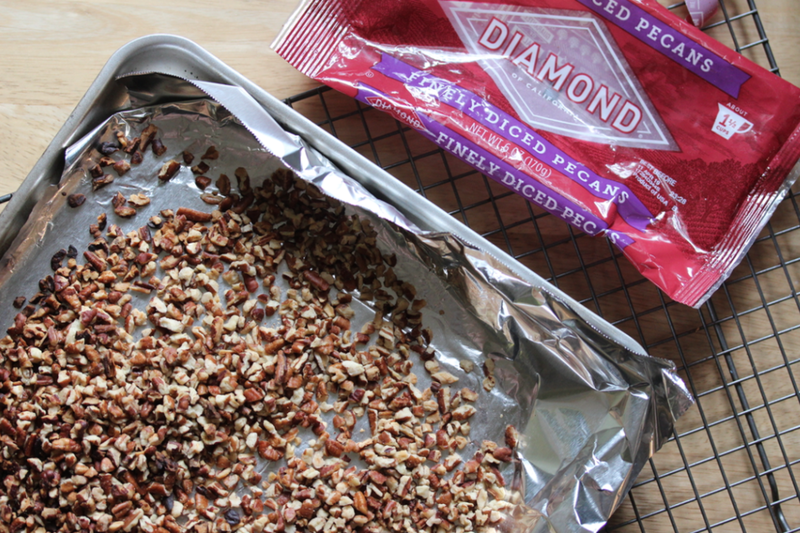 Mix together carrots and pecans in a separate bowl. Using a hand mixer or stand mixer, beat the eggs, oil, salt and sugars on high speed for about four minutes until lightened, making sure no lumps of brown sugar remain. Add honey, yogurt, vanilla extract and beat two additional minutes until smooth. Mix in the dry mixture on low in two batches until just combined, then fold in the carrots and nuts. Divide among pans and bake for 25-35 minutes or until centers are set. Cool, fill, and frost. Located in Atlanta GA, Kookie House is a no flex zone of contemplation on sweetcraft: cookies, cakes, candy, you name it. Support me on Patreon and get access to the Cosmic Flat baking newsletter!